The Round-Trip feature is designed to conduct mass editing of multiple items in Jama. It is important to keep in mind that this feature is exclusive to Excel documents only. 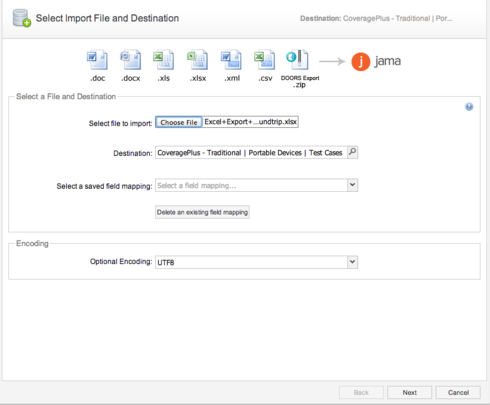 This is done so by exporting the desired items to an Excel Document, making the desired changes offline, and importing the edited document back into Jama, where you will see the updated changes to the items. In this example, we will be using test cases. While in List View, select the files you wish to export for Round Trip. You can select multiple items by holding the Ctrl button while clicking on the items you need. 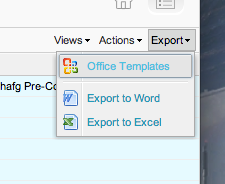 Go to the "Export" in the top right corner, and select "Office Templates". This will open a pop-up window. Select "Excel Export for Roundtrip" and click "Run". Note: Roundtrip is only available to be exported to Excel. Rich-Text Fields can oftentimes create difficulties within Excel and should not be used for Round-Trip. It is also possible to add new items to the Round-Trip export that will in turn be added into Jama once the document is imported. If you add an item to your Round-Trip document, it will appear at the bottom of the Set or Folder you decide to import to. It is important to keep in mind that you can only add one type of item, which will be the same as the chosen set or folder. The ID and Global ID will be assigned to the item once it is imported, so be sure to leave those columns blank. Assigned and Priority are all columns that can be filled out, but are not required. When you are satisfied with the changes to your document, it is time to import it back into Jama. (Be sure to save the file before importing.) Right click the folder or set you exported your items from, and select "Import". Select your file and hit "Next". 1. The Excel Header Row starts at 2 on the Round-Trip export; be sure to change it as it will automatically be selected as Row 1. 2. Making sure the "Update Items" box is checked. You also have the option to decide how your items will update if there is a conflict between your Excel document and Jama. If you want your Excel document to "win" should a conflict occur, be sure to change this option. Since this is a Round-Trip document, it is likely that you will not need to set the hierarchy, and we will not for this example. However, should you need to use hierarchy in your other Excel imports, you can do so by indenting or coloring cells. 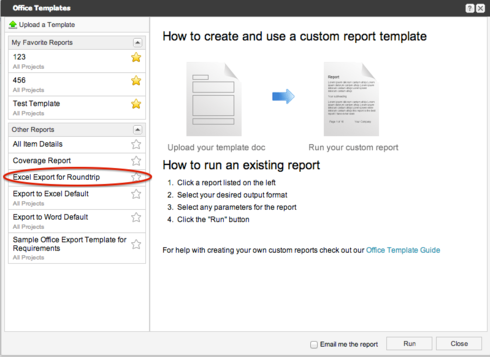 Please note that for Round Trip reports, hierarchy changes will only be applied to new items in the Round Trip report. More information on hierarchies is available in our User Guide, available here. Remember to refresh your window in Jama to see your updates. If you are still experiencing issues with Round-Trip, please contact Jama Support and we will be happy to help you further! The second to last screenshot on this page has a button that says "Save this as new document mapping." What does this button do? I successfully saved the mapping, but I am not sure where the mapping is being saved or what is being saved. Another quirk of round-trip export/imports that we stumbled on is that it can overwrite another project if you mix up the round trip spreadsheets so care must be taken when using this feature. Ohhh... Good catch on that! So it actually works fine for my need to import changes across 47 sets of requirements at once (the UI is just a bit quirky). I just thought I would post this for other people's benefit (particularly people just expecting changes to a single set!). I would say round-trip support of folders in this case is wonky; it should respect hierarchy and you ideally should be able to make changes to folders via round-trip, but there are some bugs that prevent it from always working as expected. Text items are a special sort since they can live anywhere (e.g. outside of containers). I wish there were a way to force this to work given what you point out. That is what the online documentation states; however it does (and has since I have been using Jama) also import changes to text items and folders within the set if these were exported at the same time. Of course only fields in the list view can be changed. The problem lies in the fact that Round Trip will import only one item type at a time...and because containers (folders, sets), are considered item types, they can't be roud-tripped. I don't have another suggestion. We would like to use roundtrips to update fields within our dataset of requirements. These 4,000 or so requirements are organized into 45 sets under a single component. From experimentation I couldn't find a way of updating more than a single set at a time even though the round-trip export allows export of all requirements at once. The documentation doesn't make it clear what targets are allowed for imports (though the cheatsheet implies that it has to be a set or lower). Any ideas to simplify the import across all sets (other then using the API)? Victoria, it looks like you also submitted a support ticket for this issue. Because Paul has already started the troubleshooting process, I think it's best to let him continue. Don't hesitate to post to the community in the future, though! We have support engineers available in both places. Hi, I have a similar question on importing excel files to update and overwrite data in the same fields. I updated some of the data in my Excel file which was originally created via a round trip export. I had selected "Update, on import Excel wins" option, but when I import, I have another duplicate set of requirements that are imported, rather than updating the requirements that I already have. How do I update my current fields with the updated info? Hi Anand! I'm so glad to hear that Round Trip is now going smoothly for you (no doubt thanks to Stephen's tips)! Please let us know if you run into any other hurdles! Anand, I am glad that you are able to import. A name field is configured so that it is limited to 255 characters if I am not mistaken. Have a good rest of day. That worked. In our project we don't use "Name" - since it truncates above certain limit, instead we were using Description and Requirement Text. For this specific purpose I double mapped "Name" as well as "Requirement Text" and the items got added. Hi Anand, I am sure that Janessa and official Jama support engineers can help you. The only hint I have is that you might have to make sure the mandatory field "name" is filled in. If it's blank, then Jama Excel import will skip that line entirely. 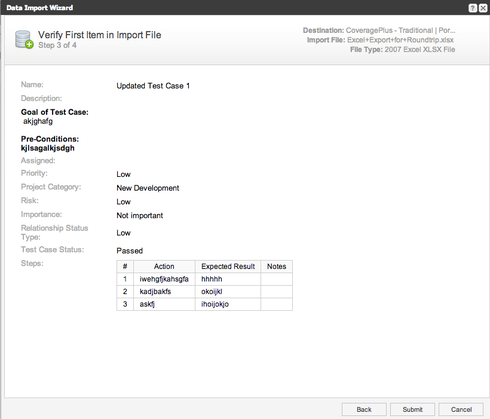 You could also try to debug your import process by importing just a few new items. Good luck. (3) I suspected this, so searched all my requirements with the keywords from new items. Nothing shows up, also scrolled down manually looking for them. Hi Anand! Stephen brought up some really good troubleshooting questions and pointers (thanks, Stephen! ), however if you're still running into issues with the round trip report, I am more than happy to assist you through opening a Support ticket! Thank you for reading it, Stephen! I love your cheat sheet, especially #1, #16, and #22 (or, the ones that have personally tripped me up the most)! I also think performing a baseline is a really great idea; thank you for the tip! 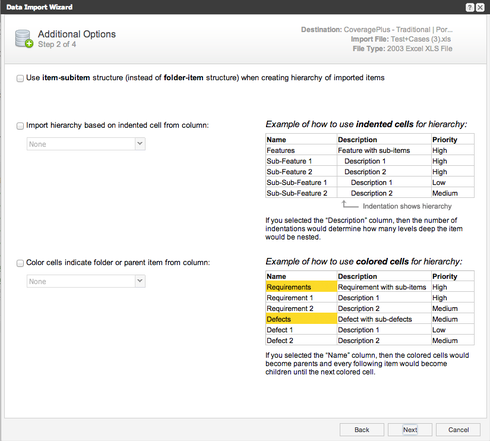 Purpose: A Jama author (with read/write permission) can use Excel-RoundTrip (RT) report to make complex/batch updates to a selection of items instead of editing items one-by-one, in list/reading view, or using batch update (setting a collection of items’ properties to one value only). 18. Fields that are mandatory need a default value. Go ahead and select anything. If no input fields are mapped, nothing will be updated. 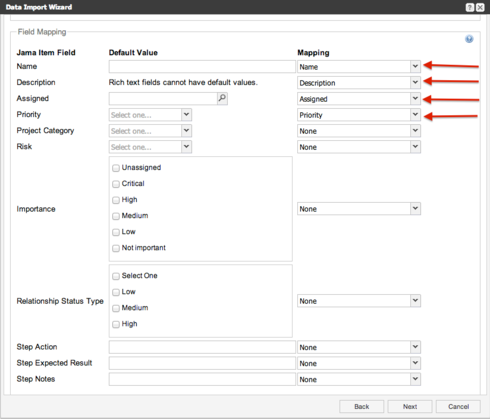 If input fields are mapped, then the values in Excel worksheet will be imported correctly. Sorry for your troubles. Can you explain a little more about your issue? 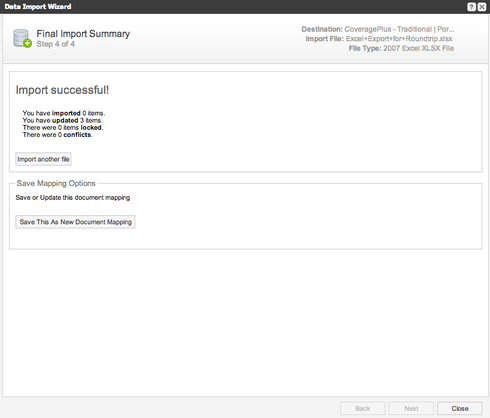 1) At the end of the Excel import, did you check whether the confirmation says whether the items were created? 2) Please refresh your explorer and item pane. 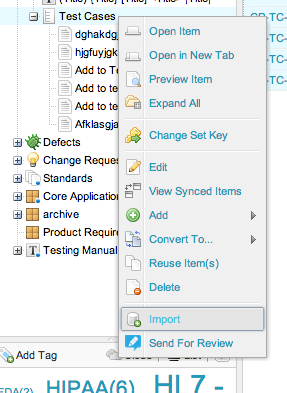 3) Be aware that the new items are added at the end of the highest set/folder where you have selected as target import. Good luck in resolving your issue. Thanks for your patience and understanding. Mike, I'm sorry we missed this question. The answer is no—there is no way to map values via import or Round Trip to the "item of type" field. Functionality is quite limited for this item type. If I have a pick list field which is using "item of type", is there a way to update/create the values using the Round Trip template? I can't seem to find a way to export the value or a way to set the value on import. We use this often, particularly to make global changes - something which shows up quite a bit in the fora. One thing we experimented with the other day was added a step to a set of test cases. We found you need to preserve the values in the hidden low columns, i.e. duplicate rows rather than insert new rows, but it worked well for us.